Our young horse should get to know many different significant training contents little by little. So, it needs to develop a concept of the direction, speed, and gait we want it to move. Likewise, when working with positive reinforcement in particular, the horse needs to learn that different lessons require different roles of humans and horses. In some exercises the human is active and the animal remains passive, for example when our horse should wait at a stationary target. In contrast, the animal is active and the human remains rather passive when we do free work later in training, or when we work with the longe line. What is more, there are other exercises that require both partners to synchronize their movements, for example when standing next to each other, or when we lead our horse. So, what does this mean in practice? For instance, initial work with treat spots and a poles-square enables us to develop the more advanced role concept of an active horse and a rather passive human being. 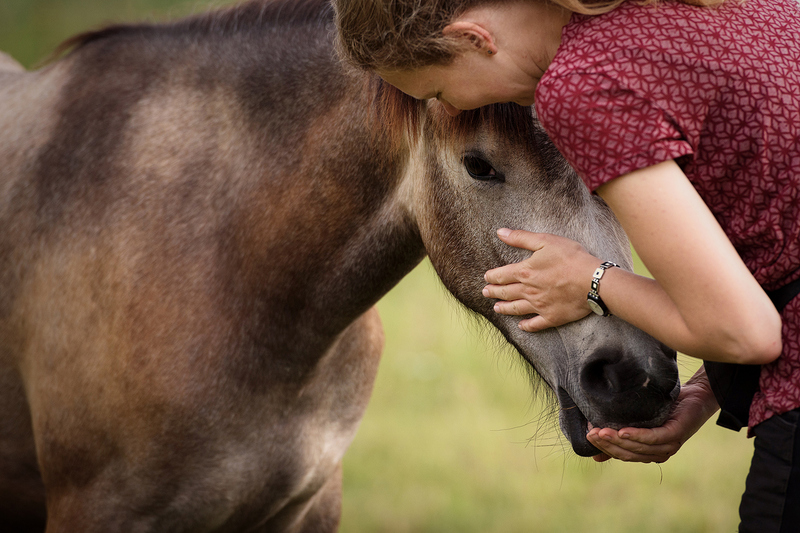 Two-year-old Icelandic mare Kátina and her favorite human being Barbara demonstrate in the following seminar video how they go this way together. We want our horse to independently circle around the poles-square later in training. So, it is important to exclude possible sources of error right from the beginning in order to reach our goal as quickly as possible. Kátina, like most young horses that are positively trained, knows from previous experience that rewards are given frequently and directly next to the human being. As a result, it pays off to mostly remain in close contact with Barbara, and to use Barbara’s proximity as a reference point for orientation. So, it is a crucial step in the learning process to make Kátina aware of the poles, and to make her understand that she is allowed to distance herself a bit more from her favorite human being. Barbara chooses a rather small poles-square that matches Kátina’s body size, and also marks the corners with weighted posts; so, it is likely that Kátina will try to cut corners a lot less with these additional prompts than she would with ground poles alone. What we call concept training is an important aspect of RPlus. 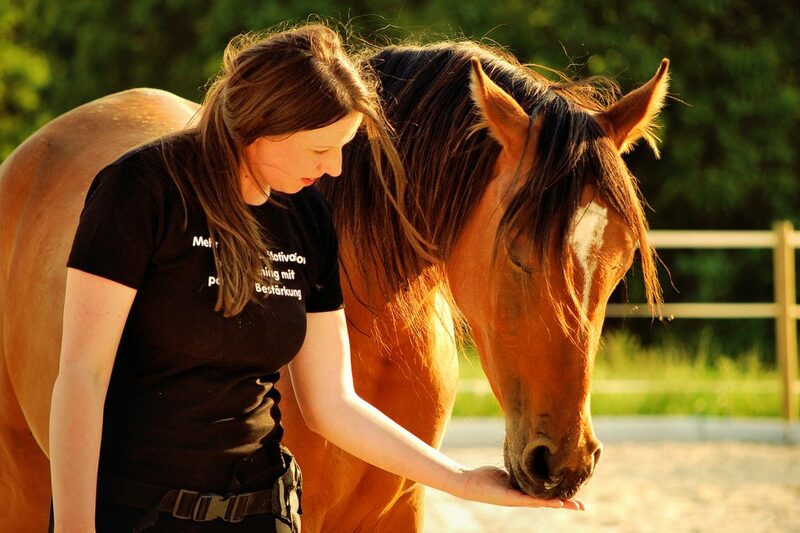 Of course, we provide our horses with specific signals for clearly defined actions but our horses also frequently learn to understand basic mental concepts that reflect our common goals, and further an understanding of the actual training situation; for example, a concept that is relevant for the poles-square is “inside and outside”. Initially, the horse understands the concept purely in relation to this exercise, and with reference to the poles on the ground. In general, the horse’s understanding of such a horse-abstract category grows ever more rapidly after it gets to know a variety of different training exercises that help to reinforce and broaden the initially rather specific concept. This means for example, the horse can be sent away from the human to move through a passage or around a fence of an agility course just by giving the signal “outside” later. A further useful concept would be to establish a basic idea of “right and left” just the way it is done with horses that are used to move big wooden trunks. In this situation, human beings want to be able to remain behind the horse, and still direct it through voice signals to move in this direction or the other. In the end, we can think of many different possibilities that result from concept-training; for example, we can illustrate distinct settings concerning a specific task for our horse, and our horse is able to understand and distinguish the meaning of human categories like “small and big”, the concept of color, or the variety of shapes of objects. Any occupation that involves concept-learning is mentally demanding for young horses, and more generally for all horses, just the way it is for us as human beings. It requires peak cognitive performance to develop one’s own basic idea of abstract overarching areas of learning. Therefore, it is at least as important to take breaks from learning as it is to work on specific content in training. The entire video with Kátina and Barbara is not much longer than two minutes. Of course, there is great variation in the amount of time different horses are able to focus; however, the general rule of thumb is “the shorter the better”. And always stop before mistakes begin to happen, before the horse becomes overwhelmed or loses the joy of working together; this ensures that we remain motivated together, and still increase our cognitive possibilities in the long run.